It seems that even the most expensive and most rare hypercars aren't out of reach anymore for tuning companies. We already know that DMC is working on a more extreme LaFerrari FXXR and we've already seen the first McLaren P1 to wear aftermarket wheels. 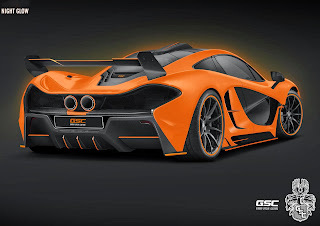 Now German Special Customs announced that they are working on the McLaren P1 Night Glow which has a new aero kit and even some engine tweaks that will push the power figure to more than 1,000 Hp! Besides the modified front bumper, rear diffuser and side skirts, the car also gained an adjustable rear wing and a roof scoop. Also part of the package is the new bespoke exhaust system with 100mm pipes. 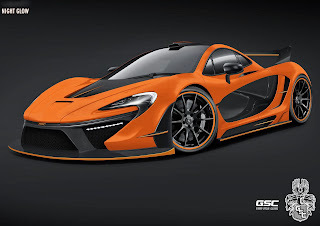 Is it a good idea to modify the aerodynamics of a McLaren P1? More details in the press release after the jump. The times are long gone, in which the catchword “Hybrid” merely brought a smile on the faces of fans of “green” high-tech engineering. After the combination of combustion and electrical engines was initially and exclusively developed and applied rather as a non-humorous fuel-saving technology, the latest generation of super sports cars now counts on the hybrid drive systems. All for completely different reasons: namely the generation of more capacity and even more brutal driving performances! The British bolide McLaren P1 is now thus also being fired by a hybrid drive following the German model sportscar Porsche 918 (with a system capacity of 887 horse power) and the Italian diva Ferrari LaFerrari (with a system capacity of 963 horse power). For the P1, this means in pointblank language that there is an additional 179 horse power-strong electrical engine to back-up the already 737 horse power-strong, 3.8-liter Biturbo V8 engine. The system capacity is a brutish 916 horse power and the maximum torque, a massive 900 Nm. The resultant driving performance is barely different from that of a Formula 1 monopostos: According to factory figures, the McLaren P1 shoots from 0 to 100 k.p.h. in just 2.8 seconds, reaches the 200 k.p.h. limit after 6.8 seconds and effortlessly breaks the 300 k.p.h. sonic barrier after an unbelievable 16.5 seconds. The electronic lock impeding further pace in speed growth then sets in only at 350 k.p.h. Yet the hybrid-McLaren is not only capable of running fast and straight: According to official figures, the P1 is reported to have circled the highly demanding northern loop of Nürburg ring in less than seven seconds. Can such a bolide actually still be improved upon? Jens Engelmann, the creative brain behind the exclusive tuning label German Special Customs, (GSC) is positive: “It can!” And accordingly, German Special Customs presents a draft in Chemnitz under the title “Night Glow”, on what such an optical and technically re-sharpened McLaren P1 may look like! 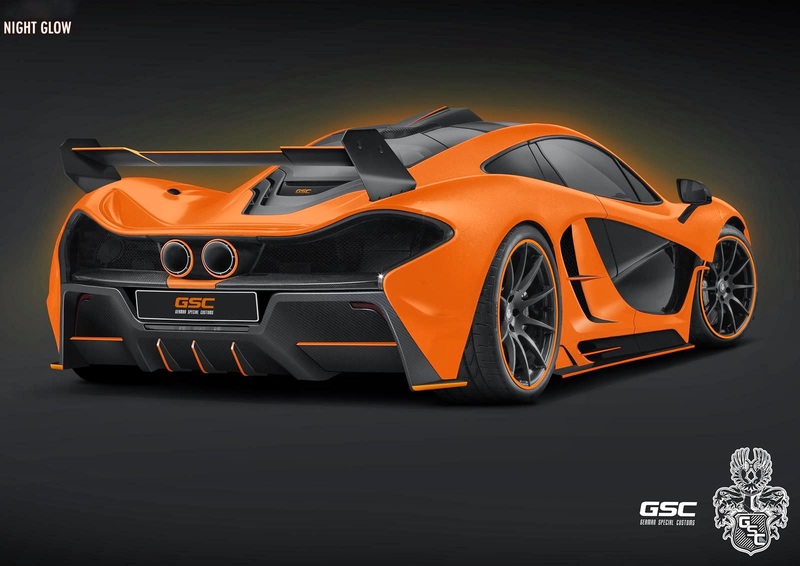 The exterior of the McLaren P1 “Night Glow” that is presented as preview, is trimmed by GSC once again, in the direction of car racing, using the company’s own aerodynamic kit. For instance, the spoiler blade protruding forward and the side blades on the newly designed front apron with LED daytime driving lights and large air inlets for cooling, the adjustable XXL rear wing and the roof air-scoop are thus classical insignia of full-blooded racing cars. To match this, German Special Customs also designed the side skirt and the rear diffuser in a clearly incisive manner and integrated air inlets into the rear side walls of the bodywork. The trapezoidal serial exhaust end-pipe of the P1 is replaced by German Special Customs with two round 100-millimeter end-pipes, which reminisces of the driving engine of a fighter jet. And the new GSC exhaust system does not only look good, it is also a decisive integral part of German Special Customs’ performance boost: More than 1,000 horse power is envisaged!